Get ready for some chaos on Saturday. Maybe. It’s hard to know without Nebraska having played a game, and not much easier to know after just one game for Colorado. But based on the two seasons prior to this one –– the two Nebraska’s staff spent at Central Florida, of course –– a game between the Knights and Buffs likely would’ve been a little bit crazy. We'll see if that potential is simply transplanted to Lincoln on Saturday. On the defensive side, that is. Sure, the offenses are both spread-based and like to use a high tempo at times, but beyond those superficial similarities Nebraska offensive coordinator Troy Walters said there actually isn’t that much in common schematically. The defenses, however, shared at least one big statistical trait over the 2016 and 2017 –– they were the best at creating what I’m calling takeaway opportunities. Colorado and UCF both averaged 7.1 per game over the previous two seasons combined. National average over that time frame was 5.2. Colorado and UCF were the best defenses in the country at creating chances (forced fumbles, passes defended) for their offenses to have the ball back. Takeaway opportunities was a random idea I hit on last spring as a way to try to understand how or why UCF generated 58 takeaways over two seasons. The idea being that over a long enough span teams will always recover about 50 percent of their fumbles and about 20 percent of their passes defended should be interceptions. Those numbers hold steady year to year as national averages, but teams playing 12 or 13 games can be far above or below that in a given season. UCF in 2017, for example, recovered 70.6 percent of its opponents’ fumbles and 28.6 percent of passes defended were interceptions. Vanderbilt, on the other hand, recovered just under 17 percent of its opponents’ fumbles and just under 13 percent of the Commodores' passes defended resulted in an interception. >>The national average for TakeOpps per game to this point is 5.4, fumble recovery rate is reliable as ever at 50.3 percent and interception rate was a little low over the first 133 games of the season at 18.1 percent. >>Frank Solich’s Ohio Bobcats created 16 TakeOpps during their narrow win over Howard to lead the nation. South Carolina created zero, and didn’t need any apparently, while beating Coastal Carolina 49-15. >>Florida State was doubly doomed during its 24-3 Labor-Day loss to Virginia Tech. The Seminoles only generated four TakeOpps, but had 2.4 expected takeaways thanks to additional Hokie fumbles and finished the game with zero actual takeaways. Meanwhile Virginia Tech had five takeaways with an expectation of 2.2. Only Fresno State was “luckier” on that front, wringing seven takeaways out of a 2.8 expectation. >>This merits watching this Saturday: Colorado had seven passes defended during its 45-13 win over Colorado State. That tied for 19thnationally to this point. Those seven passes defended only resulted in one interception, but the Buffaloes are off to a good start again as far as creating takeaway opportunities. >>So is UCF, for that matter. The Knights created 12 during a Week 1 win over Connecticut, which tied for second nationally with Tulane. Great read from Jacob Padilla on the Malcolm roots of two players in tonight's Nebraska-Creighton volleyball match. Recruiting analyst Greg Smith takes a look at the week ahead in high school football for Nebraska's in-state commits, and Erin Sorensen caught up with Isaac Gifford. The Lincoln Southeast star, and younger brother to Nebraska captain, Luke, is seeing is recruiting interest pick up. 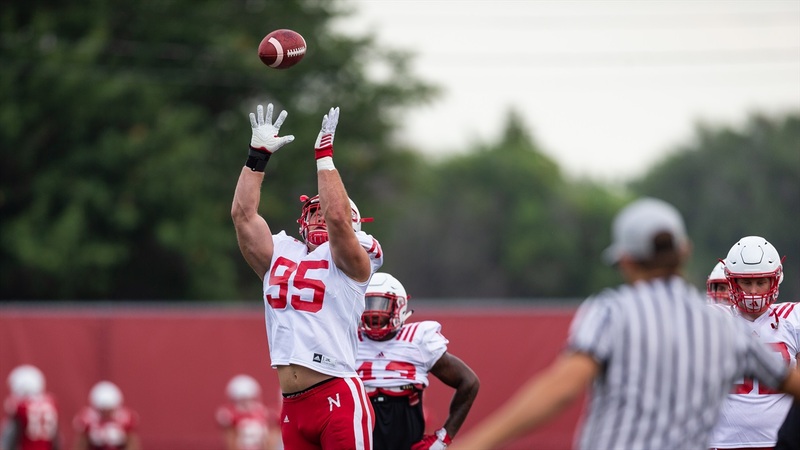 Derek Peterson has your practice recap as well as an overview of Bill Moos's discussion of Nebraska's 12th-game options. But wait, there's more! Good mailbag this week. Keep sending those questions.